There are a number of golf courses in the immediate area of The Costa Brava. The best of them is The P.G.A. Golf de Catalunya situated near Girona airport, about 45 minutes away from Casa Dos Torres. It has recently been the venue for European competitions. Other highly regarded courses are; Golf Emporda and Golf Platja de Pals as well as Club Golf d’Aro at Mas Nou, Platja dÁro. These last three courses are all within 20 minutes of us in Calella de Palafrugell. Advance booking is advisable but there is not usually a problem getting a tee off time. Visit our links page for further details. Sunset at El Far de Sant Sebastion (beside the lighthouse at Llafranc) is very popular. The sun sets behind Calella and as the shadows lengthen the view gets better and better. A sundowner at the north end of Llafranc is a “must”. Playa Castells just off the Palamos road is a lovely big beach for a sundowner also but take your own bottle. For the forthcoming year, we would like to try and introduce the surrounding countryside to a wider public. With this in mind we have introduced a range of options, as detailed in our Casa Dos Torres Holiday Options. Hot air ballooning has become very popular and Airona www.aironaglobus.com have a very good flight over the Empordà. There are more Michelin Star restaurants within the immediate area than anywhere else in Spain. Between Girona airport and the coast is Els Tinars, Santa Christina d’Aro which is very popular and always a delight. This restaurant has one Michelin star and is therefore excellent but expensive. If heading to or from Girona airport at lunchtime Can Panades on the mainroad (C65) at Llagostera is excellent for their “menu”. After years of being the best restaurant in the world, “El Bulli” has closed it’s doors. It will reopen as a teaching academy. Taking its place is Celler de Can Roca in Girona with three Michelin stars. A favourite of ours is “Les Cols” on the outskirts of Olot in the Garrotxa region, west of Girona. It makes an ideal day out for lunch in a beautiful part of the world. Currently Les Cols has 2 Michelin stars. The area around here is noted for its cuisine but you need to know where to go to find the best Catalan food. Calella itself has numerous restaurants to suite all tastes. Seafood in particular is a speciality with many places presenting a very similar “carta”. Calou, a tapas bar in Calella, is by far the most popular but Fiego’s on the beach is always packed and during the main season a reservation is required. A new restaurant at the lighthouse, Far Nomo, is receiving tremendous reviews. Between Calella and Llafranc there are over 40 choices! Pa i Raim in Palafrugell is the best one in town for both lunch and dinner. For driving directions from and a location map of Calella de Palafrugell click here. The Dali Museum in Figueres is the second most visited attraction in Spain! It contains the broadest range of works spanning the artistic career of Salvador Dalí (1904-1989), from his earliest artistic experiences and his creations within the Surrealist movement down to the works of the last years of his life. Cycling is a popular local pastime on specified cycle routes. There are cycle tracks all over this area and if you feel up to it we can give you some hints on the best routes. We have a couple of mountain bikes plus an electric one for guests to borrow, plus helmets! 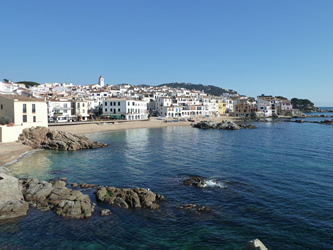 Walking – There are numerous coastal routes both to the north and the south of Calella de Palafrugell. Various local Medieval villages e.g. Peratallada and many other places of historical interest Visit the ruins at Empuries near L’ Escala.